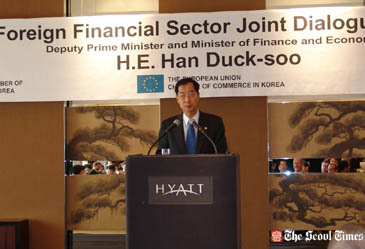 On "Economic Developments, Financial Hub Initiative"
EUCCK President Frans Hampsink invited Deputy Prime Minister Han Duck-Soo on Nov. 2, 2005 South Korea's highest financial official to give a speech on the economic status of the East Asian nation and its economic outlook. 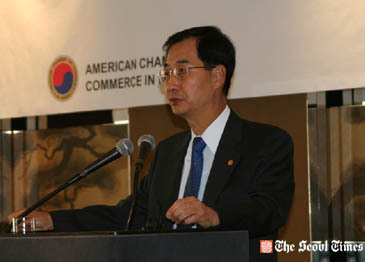 Dr. Han's speech meeting was organized jointly by AMCHAM (American Chamber of Commerce), EUCCK (European Union's Chamber of Commerce in Korea), and Foreign Bankers' Group (FBG). The meeting was held at the Hyatt Hotel Seoul between noon and 2 p.m. Dr. Han gave a speech on "Recent Economic Developments and Financial Hub Initiative," which drew hundreds of EUCCK members and other VIPs. 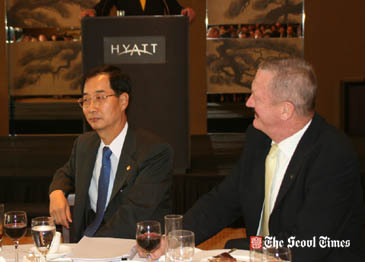 EUCCK President Frans Hampsink (right) talks with Deputy Prime Minister Han Duck-Soo. In his speech Dr. Han Duck-soo, who is deputy prime minister as well as minister of finance and economy, stressed that the Seoul government is ready to turn South Korea into the financial hub of the East-Asian region. The following is the full text of the deputy premiere's speech. Let me first express my heartfelt appreciation to the secretariats of AMCHAM, EUCCK, and Foreign Bankers' Group (FBG) for organizing this meaningful event. I am delighted to be here with all the representatives of prestigious international financial institutions based in Korea. It's good to see many familiar faces here today. I am here to share with you Korea's recent economic developments as well as our financial hub initiatives. First, I am happy to tell you that the Korean economy has moved into a recovery phase. Export continues its solid growth, but a more significant development is that private consumption began to recover. Deputy Prime Minister Han Duck-Soo delivers a speech. During the last couple of years, the household debt-hangover problem has been the greatest obstacle, leading to contractions in household spending. Private consumption has run downhill for six consecutive quarters since the 2nd quarter in 2003, up to the 3rd quarter of 2004. This unprecedented stagnation shows how severe the contraction of consumption was. However, private consumption rose to 4.0 percent in the 3rd quarter, showing that the debt problem in the household sector such as credit card hangovers are phasing out. Reflecting this recovery of private consumption, the growth rate has consistently been on the rise. From 2.7 percent in the 1st quarter, and 3.3 percent in the 2nd, the growth rate has almost reached the potential level, by marking 4.4 percnet in the 3rd quarter. We are expecting this recovery trend to continue next year. In particular, it is important to note that the recovery of private consumption in this turn is self-generated rather than boosted by the government. This suggests that it can be fairly robust and sustainable. 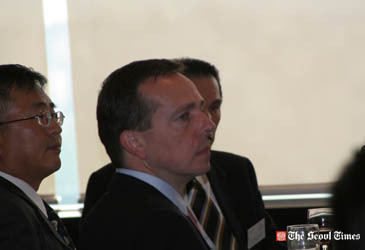 Amb.Tomas Smetanka of Czech listens to Dr. Han's speech. I would like to point out that the market also agrees with our expectations. For example, the recent stock market rallies show the expectations on the Korean economy. It is not just domestic economic agents but also international organizations who share the expectations of Korea's economic recovery. As an example, Standard & Poor's has recently raised Korea's sovereign credit ratings from A- to A and Fitch Ratings subsequently upgraded the ratings from A to A+. What's more, such signs were once again confirmed in October, when we successfully priced 1 billion US dollars(EUR tranche 500mm, USD tranche $400mm) equivalent dual tranche global bond offering with favorable conditions. Nevertheless, the Korean economy still faces challenges such as aging of the society and bipolarization issues. The crucial point is the government's awareness of these problems and its willingness to take precautionary measures. By enacting the 'Low Birth Rate, Aging Society Act' this May, the government is planning on middle-and-long term preventive measures for the aging society. This plan will encourage women's economic activity, boost the birth rate, and improve pension systems. For those are left out from the competition process, a wide-range of social safety nets will be established and expanded. These measures include enforced national basic livelihood security act, improved welfare and self-support system, job training, and expanded social insurance policies. As long as we recognize our challenges as such and make preparations, they can no longer be considered risks and challenges. We believe that the most effective policy to resolve such issues is to develop a new impetus for economic growth. In this perspective, spurring the productivity of service sectors is urgent, as they form another essential part of economic growth and employment. Especially, the financial industry lies at their core. By developing such growth engines, the Korean economy will be able to regain its dynamism. 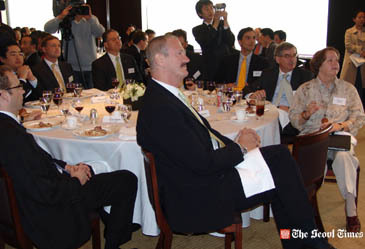 EUCCK President Frans Hampsink listens to Dr. Han's speech along with other participants. The motto 'Financial Hub Korea' symbolizes the efforts of the Korean government in response to overall challenges and conditions. Through these initiatives, we will comprehensively overhaul the financial market system. Let me start with discussing the swift deregulation plans in store for our financial markets. In order to draw out development and innovation in the financial markets, regulations must be dramatically eased. The government is working in two directions toward this financial system innovation. The first is consolidating the current regulation system sorted by industries into a system categorized by function. The other direction is making a transition from the current positive-list system to a negative-list one. These two directions will encourage innovation in developing new financial products and business operations. To support these efforts systematically, we plan to complete the drafting of the Capital Market Act this year. This consolidated law will be submitted to the National Assembly by next year. At the same time, foreign exchange liberalization will be extended further. For instance, starting next year, all capital markets will be liberalized by removing the remaining few regulations. Secondly, let me bring your attention on our efforts to advance financial markets, in particular, asset management industry. With the restructuring of the investment trust industry, confidence in asset management industry has increased significantly. As a result, AUM (asset under management) has recovered its level of 200 trillion KRW (Korean won) for the first time since 1999. In addition, when the retirement pension policies come into effect at the end of this year, the asset management pool is estimated to increase to 71 trillion KRW. These achievements will serve as the foundation for further development of the asset management industry. As well as continuously pursuing deregulation of the asset management industry, the government will utilize KIC to actively attract foreign asset management companies to Korea. As a result, advanced financial techniques will be transferred to domestic markets and serve as catalysts to the development of asset management industry. Even now, several foreign financial institutions are looking to move into Korea through KIC, and the government is fully supporting their successful setup in the Korean market. Our third objective is fostering qualified finance professionals. Finance is a business run by people like you, which is why this task is so important. We already have finance education institutions which focused mainly on general education. However, these were not sufficient to satisfy the demand for finance professionals with a global perspective. In response, a finance professional school with a MBA course is awaiting its opening in March of 2006. Just as important as fostering finance professionals is the task of connecting the supply and demand of these finance human resources. Thus, a network center for finance human resources will be set up later this year. The center will also serve as the mediator of supply and demand regarding finance education and training. Fourth, we will strive to establish global networks. This calls for many global players to move into Korea. When international financial institutions and financiers are gathered in Korea, I believe that Korea can naturally become the center for international networks. To resolve grievances of foreign financial institutions, a task force team awaits its imminent launching. This team will be comprised of officers from public sectors and employees from private financial institutions. Furthermore, the team will assist the establishment of global networks by extending one-stop services to foreign financial institutions in Korea. You will find leaflets on the table where you are seated. In addition, an international seminar is planned for early December this year, where internationally renowned financial institutions, CEO's of foreign financial services, and other distinguished guests will grace the floors. Finally, the policies will be pursued based on consistency and stability. To this end, legal and systematic measures for the financial hub initiatives will be established. Tentatively named "Act on the Creation and Development of a Financial Hub," this article will be ready by early next year. The gist of this law deals with financial hub promotion plan, efforts to attract foreign financial institutions, transparency of financial regulations and principals for stirring up competition, and so on. In addition, we have already established the Financial Hub Promotion Committee, for which representatives from the private and public sectors will join together. The committee holds a pivotal role in developing policies and following through with implementation and coordination among interest groups. It aims to encourage participation of private sectors and to reflect the voice of private sectors. Looking back, Korea was able to overcome the financial crisis and enter the path of economic recovery, thanks to your faith and support. We appreciate your cooperation in resolving our foreign exchange liquidity issue in such a short period of time. I hope that you will develop deeper relations with Korea which will expand into win-win situations. In this light, I deeply appreciate the decision of foreign financial institutions, such as Prudential Corporation, to place their regional headquarters in Seoul. It is my sincere hope that many other companies will follow their suit. Let me conclude this speech by introducing the vision of Korea's economy, "Advanced economy with high productivity," because the financial hub initiative is, in essence, developed from this vision. In the course of working toward these goals, Korea wishes to progress and stride along global players like you distinguished guests. On a last note, it is my sincere wish to make this first meeting an opportunity to keep in close touch with you on a more regular basis. And now I will be delighted to take any questions or comments.